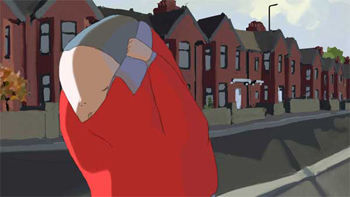 Dreams and Desires â€“ Family Ties (Beryl, Y Briodas aâ€™r Fideo), a co-production between S4C and Quinnâ€™s company, Beryl Productions International, jointly won the Public Choice 2008 prize at the British Animation Awards. Quinn shared the award with fellow Welsh entry, t.o.m., a short film by Tom Brown and Daniel Gray, produced at the International Film School of Wales, Newport. News from Bristol’s Encounter Festival is that we didn’t win our category. We did how ever win the British nomination to the Cartoon D’or, which was a complete suprise because we didn’t even know we were in that section. So we come away with something pretty cool. “T.O.M.” looks more than pretty cool to us here at Dimples’ central command center. They’ve created a myspace page for their film and you can view the trailer there.